What's Next? Revelation Series With Skip Heitzig - We live in a culture that is constantly asking, "What's next?" We want to know the latest fashions, trends, stocks, and gadgets. In a world that's always looking for the next big thing, we can sometimes forget the most important thing. As Christians, we are called to wait with anticipation for the return of Christ. 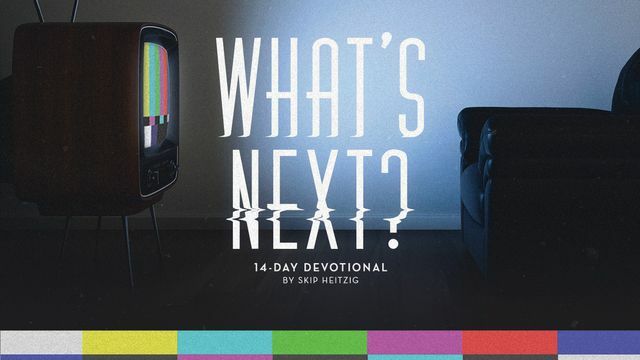 In this series through Revelation, we look forward and ask ourselves, "What's next?" People are fascinated by the future. The ancients sought omens, and people today look at horoscopes and read palms. But only God knows the future. The book of Revelation is a book of prophecies. It predicts future events, giving more details about Jesus' return than any other book in the Bible. Probe: Why is prophecy important for demonstrating the reliability and trustworthiness of Scripture? The book of Revelation is the only book in the Bible that attaches a specific blessing to its reading and study (see Revelation 22:7). Probe: Why do you think God's people are blessed when they read, understand, and keep the book of Revelation? Chapters 1-3: Jesus superintends and evaluates His church as the exalted, priestly King. Chapters 4-5: Jesus is seen in heaven as the glorified Lamb of God and Lion of Judah. Chapters 6-18: Jesus will be the judge of all the earth. Chapter 19: Jesus will return as the King of Kings. Chapter 20: Jesus will reign on earth as the bridegroom with His bride, the church. Chapters 21-22: Jesus will illuminate the eternal state and New Jerusalem. Probe: Using the only physical description Revelation 1 gives of Jesus (see vv. 12-16), compare and contrast Jesus' first time on earth (humbling Himself) to the second time (His millennial reign). Probe: Every tomorrow has two handles: one of fear and one of faith. Read verses 5-6 and 17-18. How does the vision of Jesus produce faith, giving us confidence in God's plan and purposes for the future? Connect Out: Read 1 Peter 4:11 and 1 Corinthians 14:1-3. How can prophecy help you witness to a weary world? Consider ways you can use the promises of prophecy to evangelize and explain the gospel. Sign up to receive Skip's inspiring devotionals weekly.